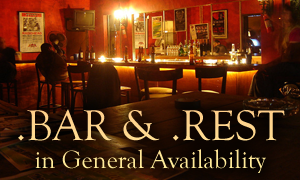 Two new gTLDs designated for restaurants, nightclubs and bars, .BAR and .REST, have been made available for registration. The new domains will provide a global platform for any food and beverage-oriented website, creating an “online neighbourhood designed specifically for restaurants and bars”. .BAR, a domain aimed at bars and nightclubs, and .REST, the abbreviated form of “restaurant” function in almost 30 languages and in approximately 50 countries. Their simultaneous launch will create a meaningful space for the food and beverage industry online. The introduction of new domains is part of a larger program set up by the Internet domain authority ICANN, wherein new domains will denote categories, making Internet addresses easier to remember and more accessible for customers. If you wish to register a domain name under .BAR or .REST extension to mark your unique space on the Internet, please click on the selected domain. Should you have any questions or need assistance, please do not hesitate to contact our Support Team at support@web-solutions.eu or via phone on : +44 (0) 208 133 3994.